We grew 6 varieties of tomatoes this year. This is not unusual, we have grown as many as 14 varieties in a single season. Why so many? The answer is simple…I’m on a quest for the perfect tomato! The views expressed in this post are just my opinion! Someone else’s perfect tomato may be one of my rejects and vise-versa. Anyway, here we go with my review of the tomatoes growing in our garden this year. 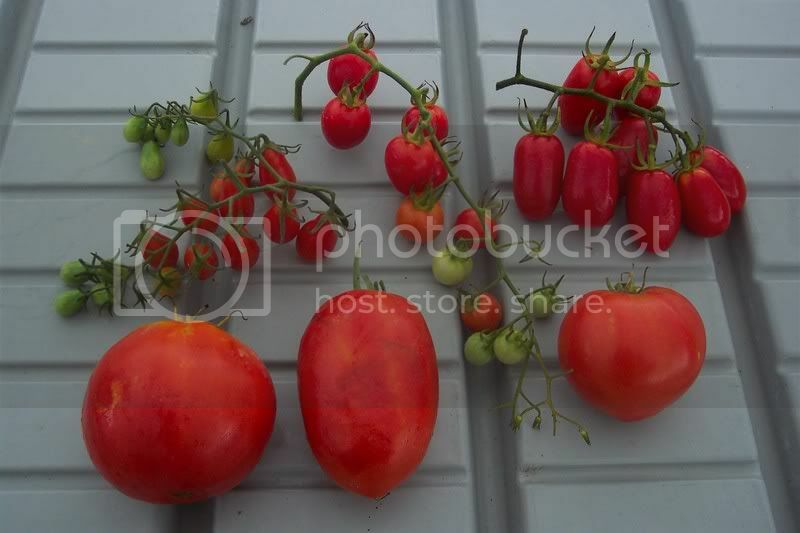 Starting from the top left,we have ‘Red Grape”, a small tomato that grows on a “truss”, (a stem-like structure that supports all the tomatoes as they grow). They are small, about the size of a large green grape you see in the produce section of a grocery store. These are very sweet. I have had a lot of non-tomato eaters say that they won’t eat any tomato, but will eat this one. One such person I know ate nearly a quart of these in one day and made herself sick on them they tasted so good! Next, in the upper middle, we have ‘Tomatoberry” also a truss tomato. This variety was featured in a previous post a few months back. It is a new variety offered exclusively by Johnny’s Selected Seeds. Tomatoberry is also quite sweet but not nearly as sweet as ‘Red Grape’, having more of a “tomato flavor”. It is bigger than Tomatoberry but still can be considered a salad tomato. To the right is ‘Juliet’ a salad/pear tomato. Juliet is right at the line between salad tomato and “pear” tomato. It is about 2″-3″ long , which makes it a little big to be served in a salad, but too small to be considered a size good for slicing. Never mind the size though, it is one tasty tomato.. not too sweet, with lots of tomato flavor! Next, on the lower left, is ‘Italian Heirloom’. It is, as you have guessed by its name, an heirloom variety. Now, I have grown many heirloom varieties in the past… some good, some not-so-good. I put this one in the not-so-good category. It has a very mild flavor, which some people like, but for my taste, it is a bit of a “washout”. This tomato is very fragile, its skin is quite thin and easily damaged. It is also difficult to harvest from the vine, its stem being nearly impossible to separate from the plant without bruising the tomato. Because of these two characteristics, you will never see these for sale in the grocery store. In the bottom center of the photo is “Amish Paste” another heirloom variety. Despite its second place showing at a taste-test, it too seems a little bland for my palate. Once again however, enough taste-testers liked it to give it second place. It may make good juice and sauce. Like the Italian tomato, it too is very fragile, bruising easily. You wouldn’t want to just “toss” these into your bushel basket! Finally, we come to “Better Girl”. In my opinion, the best tomato we have this year. It is full flavored, easy to pick, holds up well in transport and looks marvelous! The skin is a little tough, which accounts for the east of picking and transport. Better Girl also grows great in our greenhouse through the winter, making it the best all round tomato this season. Don’t take my word for it though, it’s only an opinion. Grow some of these for yourself next time! E-Z Pick, Always a Winner! No, not the Michigan Lotto ticket… the green bean. 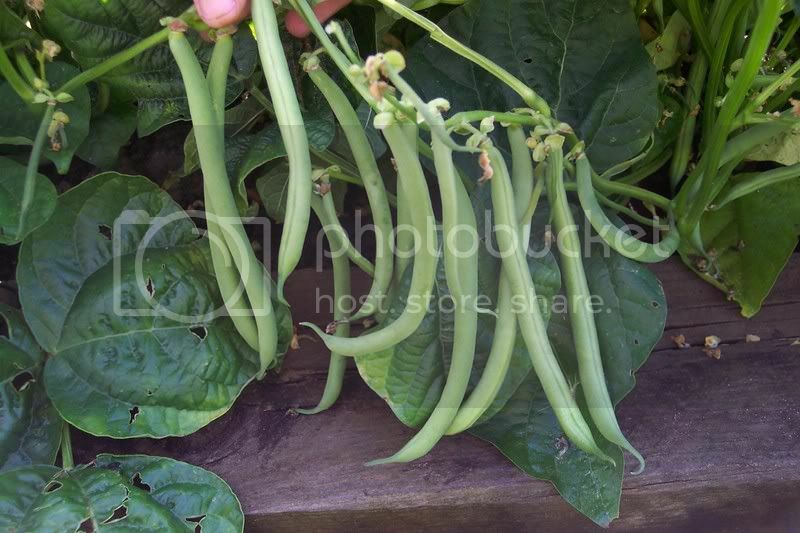 We have been picking our E-Z Pick bush beans for quite a while now. Earlier in the season we planted four beds at different times so that our crop will be spread out over the season. You can see by this photo how this variety got its name. All of the beans grow in a line like this, making them easy to pick! Today we planted part of our outdoor fall vegetable garden. One thing you have to be concerned about when planting these cool weather crops is the weather. Today it was fairly cool, in the low 70′s for the high. Also, after yesterday’s rain, the soil temperature was cool as well, making ideal germinating conditions for the lettuce seeds. The forecast for the remainder of the week is for a return to hot summer temperatures. If air and soil temperatures get too warm, these cool weather seeds may not sprout. It’s worth taking a chance on the weather however, as we usually get most of our fall crops to grow. Of course, weather at the other end of the season is as much a concern. A colder than average fall can ruin these crops… that however, will be discussed in a future post! I’m thinking about sowing peas as well. I have never had much luck with a fall pea crop, but, I have plenty of seed left over from the spring and will probably go ahead and plant them anyway. Each fall I get a big kick out of looking at the prices of lettuce in the produce department as I harvest our own from the garden. It doesn’t take much to entertain me. You probably remember from biology or health class that our ears produce wax to help keep insects and other “creepy-crawlies” out. Ear wax is also a very mild insecticide as well as repellent. Nearly all insects that are able to enter the ear accidentally or on purpose, are harmless, however uncomfortable they may feel. This is also the the case for the infamous “Earwig”, that, according to an old wives tale, crawls into your ears at night while you are sleeping. The one exception to the “harmless insect theory” is the Japanese Beetle. It is the only insect that I’m aware of that is able to work it’s way into a person’s ear (nearly always by accident) and cause serious damage. Now, I don’t want to add one more thing to the list of things for Moms to worry about, but, Japanese Beetles are known to have entered people’s ear canals and chewed through their eardrum! Apparently, our natural ear defences are useless against these miserable pests. The chances of one of these beetles getting into your ear is probably one-in-a-million, but if you do get a Japanese Beetle in your ear, you better call for medical help immediately! 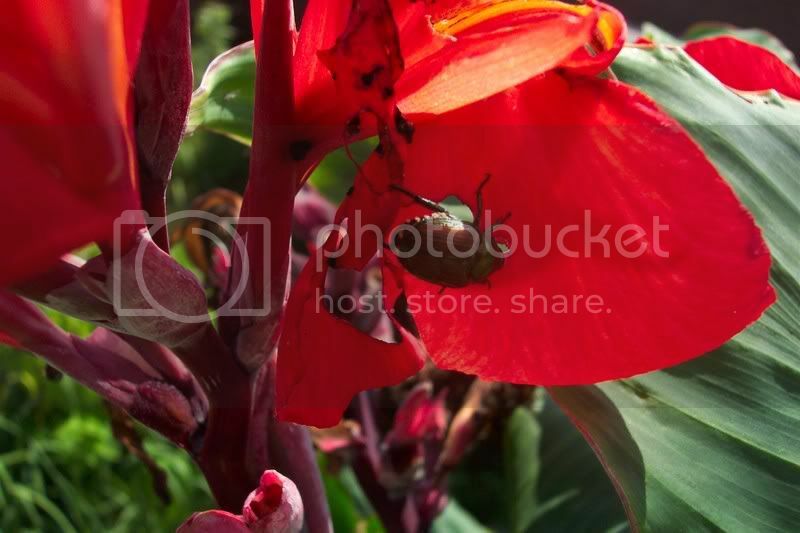 One of the things I hope to accomplish with this blog is to provide you with at least a little bit of gardening inspiration. I believe one way to do that is by posting photos of my garden and others. 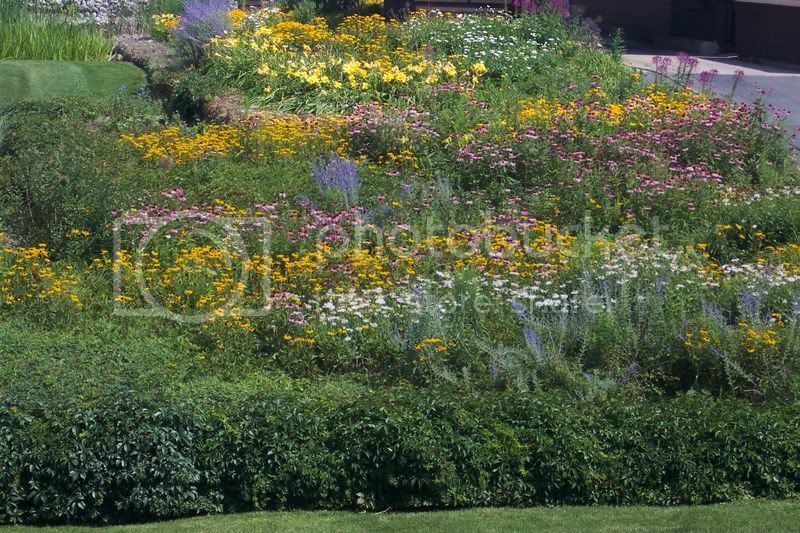 This is a photo I took last week of the perennial garden. In the foreground you see the rock retaining wall covered with Virginia Creeper. Behind that is an area covered with Periwinkle. These two ground covers fill in the space between the flowering plants eliminating the need for mulch. Watch out for Virginia Creeper though, it has a tendency to get out of hand, climbing all over everything in the garden. The tall blue flowers are Russian Sage, a semi-woody perennial that adds some vertical interest to the garden. Next are the white Shasta Daisies. At one time these were Martha Stewart’s favorite flower. There are some near the back too. Yellow Prairie Cone Flowers have a dominant role in this garden. They add a lot of long lasting color. The Cone Flowers were planted years ago by a landscaper long before I arrived on the scene. They did so well here that I decided to divide them and distribute them throughout the garden, the result of which you see here now. A long row of bright yellow Day Lilies can be seen towards the top of the photo. It’s a little hard to make out, but if you look close there are a few Globe Thistle plants off to the left. In the upper right corner are a few ‘Purple Queen’ Cleome. These are annuals I planted to add more color and texture. Finally, we have Echinacea, the Purple Cone Flower you see growing in drifts. In the fall, small song birds love to eat the seeds of the Echinacea. There are other plants hidden away all throughout the garden and we have discussed some of those in previous posts. The garden view you see here is what a guest sees from his car when travelling up the driveway. To see the other hidden gems he would have to get out of the car and walk through the garden paths.